Today marks the first day of the year of the water dragon, one of the most revered years of the Chinese calendar. It’s sure to bring good fortune and excitement! Food (and food symbolism) will play a big part in the next few weeks of celebrations. Here are some dishes for good luck in the coming year. In Chinese culture, duck symbolizes luck and fidelity. Here’s a fantastic recipe from one of our favorite chefs, Anita Lo. 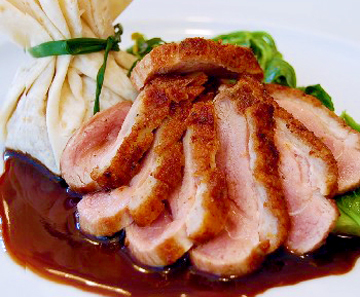 Her Breast of Duck with Hoisin and Figs mixes classic, Chinese flavors with a whimsical presentation. Or try this recipe for Roasted Pekin Duck with Shallot Confit, Asparagus, Shitake and Lily Bulb Stir Fry by Mercer Kitchen’s Chris Beischer. Cambridge, Massachusetts chef, Jason Bond puts a smoky twist on a classic roast duck with his Holiday Hu-Kwa Duck which is cured with salt and smoked Hu-Kwa tea before being roasted and basted in it’s own juices. Fresh oranges symbolize wealth and unity. This easy recipe for Pekin Duck with Orange Cassis Sauce is warming and rich, perfect for winter. 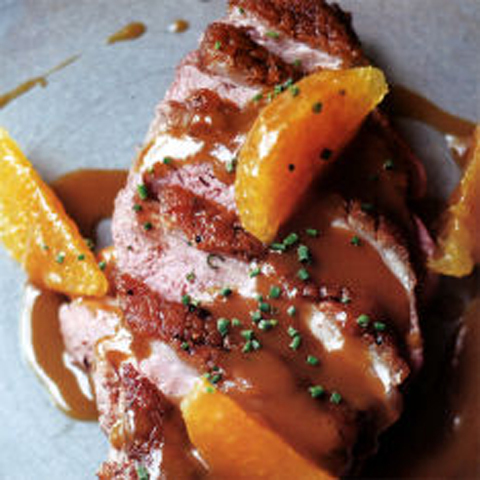 And if you ask us, you can’t go wrong with a classic Duck a l’Orange. Eat stir-fried greens for wealth since the Cantonese word for lettuce sounds like “growing fortune.” Marcus Samuelsson’s Greens combine winter kale with sweet, baby bok choy and Asian flavors like soy sauce, mirin, ginger and lemongrass. Delicious! Fried Dumplings also symbolize wealth with their golden color and ingot shape. For a decadent French spin, try these Deep Fried Dumplings with Foie Gras and Chicken Livers. Red is a lucky color during Chinese New Year and red-cooked chicken is a classic “lucky” dish, symbolizing happiness and good fortune. Mark Bittman’s version of Soy Poached Chicken is delicious and easy to make at home. Or try this sophisticated Twice Cooked Chicken with Shiitake Mushrooms, Ginger Garlic Relish and Star Anise Broth from Highlands chef, Chris Rendell. Previous Post Both sides of the coin – a must watch!